The review duo who wants to get with you and your sister. We think her name is Deborah. 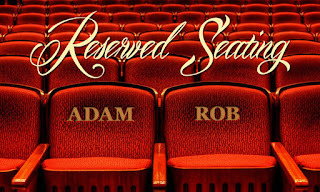 Rob: A…*ahem*...and I’m Rob DiCristino. Edgar Wright’s latest film is Baby Driver, the story of a skilled and stylish wheelman (Ansel Elgort) whose every waking moment comes with a soundtrack. Baby can't drive, walk, or perform basic functions without the right track, leaving him perpetually ear-budded and head-bobbing. He drives for Doc (Kevin Spacey), the local criminal mastermind who once caught Baby stealing, and insists he work off the debt one heist at a time. 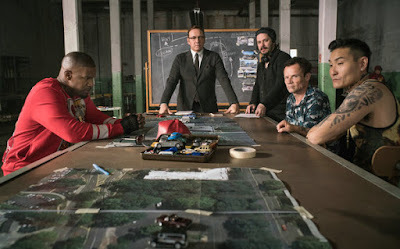 Though Baby doesn’t think of himself as a criminal, both he and his foster father Joseph (CJ Jones) know that too much time spent in the company of crooks like Griff (Jon Bernthal), Buddy (Jon Hamm), Darling (Eiza Gonzalez), and Bats (Jamie Foxx) could drag him down forever. When Baby meets Debora (Lily James), a beautiful waitress with a beautiful voice, he finally commits to getting out for good. Adam: In this clip, Baby demonstrates to the crew of the next score that he’s a prodigy and cooler in crime than his more jittery counterparts, who all want to act like they’re the primo badass. It provides an escalating tension to the action sequences throughout the film. While everyone should be super thankful to have a skilled driver like Baby at their disposal, his criminal peers are actively pissed he’s not flinching at them -- sometimes even literally. These “break down the heist” planning scenes are fun. They reminded me of a riff on Reservoir Dogs’ moments where Joe (played in that film by Lawrence Tierney) sets up the next score. Kevin Spacey is great in these scenes, showing a playfulness that reminded me of his performances from the ‘90s like Glengarry Glen Ross, where he really seemed to relish having good dialogue to chew on. He looks energized to be working around artists as talented as the ones in Baby Driver. It’s my favorite film performance of his in a long time. Rob: I want to start by saying that Edgar Wright is my favorite filmmaker. He makes movies the way they ought to be made — every shot, line, and sound matters. He’s one of the only modern directors who understands visual comedy and the power of precisely-scripted dialogue that talks up to an audience instead of down. His jokes have set-ups, pay-offs, and a true rhythm. He understands genre, especially when and how to use specific conventions to serve a narrative. More than that, he understands characters and their arcs. His characters have inside stories and outside stories. Together with Simon Pegg, he’s written three stone-cold classics driven by complicated and interesting people moving through the narrative and learning from it in meaningful ways. He adapted Scott Pilgrim and somehow perfected the video game movie. I’ve spent hours picking apart all the details and finding new meaning in moments I thought I knew by heart. I’ve used scenes and script pages as teaching tools. His movies feel like they were made just for me, and I love them dearly. With that in mind, and with two days of reflection, I have to admit I was a little let down by Baby Driver. I think it’s a slickly-made and exciting throwback to ‘70s crime films. I think it’s got a great cast and that Wright pushes his comfort zone visually in cool ways. I love the soundtrack and the way it plays into the overall conceit. But the characters and plot lack his usual pace and precision. It’s looser, gummier. It moves in fits and starts that prevent me from ever getting into the flow of Baby’s journey for any significant length of time. It’s less talky than his usual scripts (which is fine), but taking out the causal dialogue means that the visuals and action have to take its place and tell a story (ahem, Fury Road). They just don’t here and it breaks my heart. Adam: Eh, well. I’m voting Mark Ahn. What do you want to review next week? Just kidding. I’m a really big Edgar Wright fan, too. I think I had a much better time with Baby Driver than you did. I don’t disagree with you that the dialogue and characterization take a back seat (no pun intended) this time when compared to his other films, but that didn’t bug me. Baby Driver felt to me like when Quentin Tarantino made Kill Bill Vol. 1 and we saw an evolution of a director. As you said already, this is Edgar Wright out of his comfort zone, I think, in that he’s really elevating his game as an action filmmaker. I thought the action sequences, whether in a car or on foot, were very well shot and choreographed, giving me as a viewer spatial clarity of what was happening. Question for you: looking outside of this being an Edgar Wright movie, if this was just an action movie, would you think it was an above average example? Rob: For sure, and I don’t mean to suggest that I didn’t have fun with Baby Driver or that I won’t be seeing it again or buying the Blu on release day. I will be doing those things. I totally agree that this is Wright evolving as an action director; the movie looks great and moves even better. It’s at times loud and aggressive, slow and dreamy, and always very, very cool. But one of the things I find very telling is that this is Wright’s first solo screenwriting credit, and I wonder if that lack of oversight and collaboration allowed his director brain to override his writer brain a bit. In that case, this might be the purest Edgar Wright film possible, and that’s great! But it lacks the things I find really appealing about his films. That’s just me. Adam: I agree that the movie has some flaws and I want to discuss them. I think we might agree on a lot of points, even if the way the movie sits with us is different. For me, it was an experience I get maybe one or two times a year, where I’m so actively watching it as it plays that I feel an actual buzz running through my body. The alchemy of the film is firing every one of my euphoric synapses. One aspect I love about Baby Driver is that it’s joyous filmmaking. It is so obviously an artist having the time of his life making a movie. I love the movie’s cinematography (by the truly great Bill Pope, who makes Atlanta look vibrant and eclectic) so much that this might be the movie that makes me break down and buy a 4K TV so I can see it the best way possible when it becomes available on 4K Blu-ray. I like that it’s tense (the diner scene in the middle made me so nervous), it’s super romantic and that it’s melancholy. For a movie this slick, I still think it has an emotional depth on par with Wright’s earlier work. 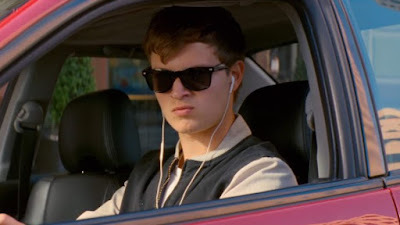 What I didn’t love about Baby Driver (and I feel personally silly for pointing some of these out and I wouldn’t if we weren’t reviewing the movie because it doesn’t really affect my appreciation of Baby Driver) is some of the characterization. I get that we’re largely playing with archetypes, but there are some major internal logic gaps happening with the Deborah character in particular, who apparently has no friends or hesitation to get involved in Baby’s increasingly dangerous hijinks. 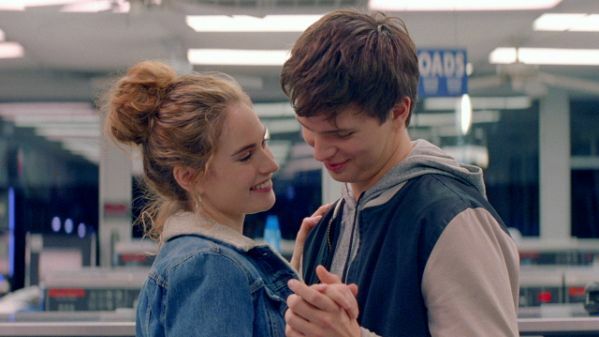 It’s a credit to actress Lily James (who plays Deborah) that she’s so loveable and has such good chemistry with Ansel Elgort that I was totally in on them wanting to ride off into the sunset together. I mentioned on Twitter yesterday that if this film came out in the ‘80s, I could see Elisabeth Shue in this role and a Matthew Modine type in the role of Baby. Other than that, I thought Jon Hamm has some trouble selling his ultimate badass portion at the end, but he was really good before that at being charming but also someone you might want to avoid. Lastly, I wasn’t crazy about the foster father character that seemed like, I dunno, a weird construct that would have been a dumb idea even twenty years ago. Those scenes didn’t do anything for me. Rob: Alright, so the characters. Like you said, he’s working with archetypes, and the lack of definition in characters like Buddy and Darling (even Joseph) are generally excusable because they’re there to serve a story function. How Baby bounces off of them helps us understand him as a character. But Doc? Even Baby himself? I need to know what these guys are thinking and why. There’s a difference between the cool, quiet type who lets his actions speak for him (the Driver, Max, etc.) and the cool, quiet type who makes choices seemingly at random. Late in the film, when Baby approaches Doc for help, I was asking myself why he went to him, why Doc would help (or not help), or what Doc was gaining or losing by doing so. What’s between these two guys? What do they give up by trusting each other? I didn’t know these things because their relationship is not properly defined. It had no stakes. Again, does this matter in a fun action thriller built around rock music and car crashes? Not necessarily. But this is the kind of thing that Wright is usually so good at! Look at similar moments of atonement in Shaun of the Dead and The World’s End and you’ll find that they pay off character arcs that were built tirelessly throughout the film. Again, these are my personal hangups. My standards for Wright are just too damn high. And speaking to your feeling of visceral excitement — that’s what I wanted! I wanted it so badly that I was sitting up in my seat as soon as the titles began, eyes peeled and ready to track over every single frame. But with a few exceptions, I never really got there with it, and it’s almost entirely due to the character issues I spoke to earlier. They robbed the action of true propulsion. Adam: I figured Baby went to Doc to get his tape back and also to try to make a truce rather than worrying about Doc going after him and Deborah, but I see your point. I think Doc helped because Baby was (just like his nephew) a chip off the old block? Someone he had grown to care about somewhat? But, again, I am reaching a little because I want to make excuses for the movie not being perfect. Since we’re on characters and performances, I want to cover the rest of the main crew and see what you thought of them. Eiza Gonzalez is fun as Darling. She looks great and can sell the dialogue well. I wish Jon Bernthal were in more of the movie (he would have been a better final bad than Hamm, I think). I loved that his last line was (paraphrasing) “If you never see me again, that means I’m dead,” and then we never see him again. Makes me wonder if he got taken out for some reason by Doc??? Just a fun little detail. Ansel Elgort is an actor I defend. I think he has a great physicality to him in action scenes (e.g. running across tables in the “Hocus Pocus” chase) and he’s an unconventional lead for this type of film in a fun way. He’s a really terrific romantic lead (he was in The Fault in Our Stars also) and that goes a long way in getting me to care about Baby. Does he sell the macho or cool guy moments? No, but they can’t all be Gosling. My favorite performances in the movie were Paul Williams (that’s a cheat, though, because he’s only in one scene - but what a welcome surprise) and Jamie Foxx, who I found legit scary in this movie in a way I’ve never thought of him before. The part where he throws the box of gum at Jon Hamm was so jarring to me because at first I was just thinking he would put someone down that got in his way in a criminal code type of manner, but with the gas station attendant it totally fueled how much danger Deborah was in when Bats, Baby, Darling and Buddy went into the diner she worked at later on. I was so relieved when Foxx’s Bats got killed off (to an amazing Blur song, which should have been Baby’s “killer track” imho) and that’s a testament to a movie having a great villain. I loved that Bats’ whole thing was to be a force of opposition to anything and everything. It didn’t matter who you were or what you liked. It was stupid and he hated you. It gave me the creeps in a good way. Rob: Lots to unpack here. I felt that the first two heists could have been combined for pacing, and I think Bernthal and Foxx’s characters could have been merged for similar reasons (though I do like them both a lot). Their loud-mouth posturing is meant, like you said earlier, to contrast with Baby’s easy confidence, but since we’re constantly hearing people talk about Baby instead of seeing Baby do things on his own, their fire lost some of its heat (pun intended). It all became noise after a while. Elgort is fine; he sold that first moment where he’s singing “Bellbottoms,” so I was with him. Hamm and Gonzalez were both a lot of fun, and I think more moments like the one where Buddy and Baby are building a bond through Queen could have given their turn against each other a little more weight. I would have liked to have understood how Baby felt about these people. But, alas. Adam: What did you think of the ending? Is it unclear if Baby is fantasizing about getting out of jail and reuniting with Deborah or do you think it’s been five years and he was paroled and released? I think it works both ways, weirdly enough. If it’s a fantasy, it feels melancholy and like their reunion will be earned, but if it’s not and they are together in the last shot it sends me out of the theater happy because they can be in love without being in any further danger. Rob: That’s something I’m really going to look at on my next viewing. My honest answer right now is that I don’t care one way or another. I was out of the movie at that point. I’m going to go with it being reality, but I really wish the film had ended when he put his hand against the speaker so he could hear the music in the car. Everything else (again, on first viewing) felt superfluous. But again, I look forward to picking it apart next time and seeing all those little details I didn’t pick up on this time. Adam: Were you rushing out of the theater to catch a second viewing of The Mummy? Rob: You know what I meant! Oh god, The Mummy was a real movie that happened! I completely forgot. I want to go back on break. Adam: Don’t go back on break so soon. We’re reviewing The Big Sick next week. And I’ve seen it already. It’s good. I’m voting Mark Ahn for Baby Driver. I like the way it makes me feel. It makes me happy and I want all the happy that I can get in 2017. I would currently rank it as my third favorite Edgar Wright movie after Shaun of the Dead and The World’s End, but I like all of his movies from Shaun onward. What’s your vote? I’m on pins and needles. Rob: I’m voting Mark Ahn. Baby Driver is a very fun movie. It’s just not what I was expecting. Doc was the only real problem I had with the movie. He goes from threatening Baby and everyone he cares about (and acting on some of those threats to some extent when he ransacks Baby's place and has Joseph roughed up slightly) to ultimately sacrificing himself for Baby because he "was in love too" at one point. The turn comes way too quickly to feel earned especially considering it was Doc forcing Baby back into working that led to everything falling apart. I do want to push back slightly on Adam's criticism of the Joseph character though. I did think that it made a kind of sense for someone who has to constantly listen to music to drown out a ringing in his ears to bond with someone who speaks entirely in sign language. If nothing else I'm sure we'd agree that it's nice for a role to be written for a deaf actor even if the character isn't particularly well defined. Thanks Ross. I didn't think my criticism of the Baby-Joseph relationship through well enough when I wrote that. I wasn't trying to be anti-deaf obviously. I got a Mr. White/Mr. Orange vibe from Doc and Baby's relationship. It was almost like a father and son relationship. The initial stakeout of the post office (before the walk through scene with Doc's nephew) even reminded me of the jewelry store stake out car scene from Reservoir Dogs. But even Mr. White was prepared to shoot Orange dead when he learned Orange was a cop. Not that I entirely believed Doc would have gone through with it. He would have had Bats or Buddy do it, and someplace where he wouldn't have to watch it happen. I never believed Doc when he told Baby he'd kill him and everybody he loved if he didn't rejoin the crew. I felt he only said it to get Baby to come back. When Baby told Bats and Buddy he lived far away, Bats said, "No, you don't." It's like Bats already knew, already did some homework on Baby. Yeah, nothing you wrote came across as anti-deaf Adam and if the character doesn't work for you it doesn't work for you. To me, I just thought he kinda made sense from what we know of Baby, although tonally the scenes with Baby and Joseph maybe don't feel like they're part of the same movie as everything else. I should also clarify (in general, not to Adam specifically), because I couldn't think of a good way of saying it in my previous post, that I don't think that just because the character or actor is deaf that it puts the character above criticism. This was a situation for me though where seeing the character and then reading a bit about CJ Jones just reminded me of how rare it is to see roles like that in widely released movies and I think probably everyone here appreciates that separate from our thoughts on the character himself. Went to see Baby Driver at 11:15 AM on Saturday and it was a different theater experience than usual for me. As I was watching it I was really enjoying it, but as with both of you it never quite made me feel that "perfect" feeling you get so rarely. There were little things here and there that y'all have already pointed out that I would notice, and it would pull me ever so slightly out of the experience. With that being said, not an hour later, I could not stop thinking or talking about it with the wife and kiddo who also saw it with me. I mean it got to the point where every few minutes I would say "Remember that scene where..." and this lasted all night and pretty much (unfortunately for all around me) hasn't really stopped. This is one of those movies that just brings so much joy to me that it allows me to overlook those little things here and there. I can't say for sure if all of the re-watches that are going to take place are going to make me notice these things less or more, but if my gut feeling has any say then the repeat viewings are only going to get better and better. Anyway, sorry for the long-winded comment. Thanks for the review you two and keep up the great work! I love this movie, which makes me worried I'm giving it too much of a pass the more I read and hear people talk about its "flaws." It has me thinking about what it means for a movie to be flawed. Film reviews, forums, and tweets are full of sentences beginning with "X isn't perfect, but..." Nothing is perfect. I can see BABY DRIVER as flawless while taking for granted its imperfection. That's life. Right? To clarify, the above paragraph was NOT aimed at anyone in particular. It's worth talking more about character motivation and development in this movie because that seems to be the sticking point for a lot of people. Some wish characters were deeper. Others are fine with them being thin. I disagree with both. These aren't shallow characters, and motivations are pretty clear. Wright gives us a lot with a few words, and suggests even more. I can see why people take issue with the female characters, but beyond being hyper-aware of how women are treated in movies (a worthwhile cause) I disagree that Debora and Darling have any less agency than anyone in the movie besides Baby. We know that Debora is strong enough to have cared for her sick mother until her death. She tells Baby she wants to hit the road and go. She chooses to go with him after the diner shootout. This movie is full of people who hide behind masks (of both the figurative and Mike Myers variety). The criminals use code names, and when their real names are revealed they end up dying (unrelated except as a neat storytelling detail). Buddy's mask slips in the last act when it's revealed that he is the true monster of the crew; more dangerous even than Bats, who hid behind a code name but was actually very transparent about his character and motives. Meanwhile, Doc's turn (another thing people have taken issue with), suggests to me that his threats to hurt Baby belied a mask of toughness hiding a genuine soft spot for the pre-teen who stole his car...and his heart. Just because Doc threatens to hurt Baby and Debora doesn't mean he'd actually do it. Criminals lie. Watching the movie a second time, after buying and mainlining the soundtrack, let me focus on background details that, if not key to understanding the film, at least let me appreciate how much damn effort Wright puts into every frame. The red-palmed driving gloves as symbol for the blood on Baby's hands after the armored car robbery, and what it meant for him to throw them away. The significance of where people sat in cars in proximity to the driver's seat: when Baby's driving it's the only time he feels in control; Bats in the front passenger seat, wanting to be behind the wheel literally and figuratively; Buddy more than happy to hang out in the back seat until Darling is killed and then he's behind the wheel Duel-style for the final showdown. Hell, I'm so deep down this rabbit hole I'm looking at parking garage signage for clues (I'm convinced Baby's on B2 after the second heist because that's when he and Doc "be square"). I could talk about this movie forever. I know that it hasn't completely clicked with everyone, and no movie does, but I'm gratified that most people seem to dig it and that there hasn't been any real backlash. ...Yet. That all makes sense. Watching movies is an intensely personal experience. None of what bothered you bothered me, not because I'm too forgiving or you're too harsh, but because things click for people or they don't. That's all good. If you listed all of those personal irritations as "flaws" or "problems" I'd take issue because personal taste doesn't equal objective truth. I know anything anybody writes comes with an implicit "I think...for me" that shouldn't have to be stated, but I've heard criticisms of the movie (especially questions of motivation or character development) that sound silly because I can come up with what seem to me easy explanations to justify all those decisions. Dialogue that sounds irritating to you works just fine for me, not in a Tarantino sense but in the way this movie works as the cinematic equivalent of a mix tape. It makes sense to me that dialogue would be as minimal and rhythmic as song lyrics. No one complains that Looking Glass's "Brandy" doesn't have enough backstory for the sailor. I think Wright is going for something similar here. "Hell, I'm so deep down this rabbit hole I'm looking at parking garage signage for clues (I'm convinced Baby's on B2 after the second heist because that's when he and Doc "be square")." One small thing: he's on P2, though. It Interesting! I Love The Movie.